A late Jermain Defoe strike saw Sam Allardyce’s Sunderland side beat Crystal Palace on Monday night and leave Selhurst Park with three valuable points. It was a poor first half as neither side was able to formulate a goalscoring opportunity, with the best chance coming after the break when Sebastian Coates saw his header cleared off the line. But as the game looked to be heading for a goalless bore draw, Defoe pounced on a lapse in concentration from the Palace defence to round Wayne Hennessey and tap into an empty net. Despite the win, Sunderland still remain in the bottom three, one point adrift of rivals Newcastle in 17th, while the Eagles miss the chance to leapfrog into sixth place. The first half was a fairly drab affair with Yohan Cabaye spraying passes around Selhurst Park without ever really finding a killer pass to unleash the likes of Wilfried Zaha or Yannick Bolasie. Sunderland were far more promising and positive than they have been in previous weeks, with their five at the back providing a sturdy base to attack from. Steven Fletcher linked with Defoe for the first chance of the game but the Scotland international spooned over the bar from his strike partner’s knockdown header. Former Chelsea left back Patrick van Aanholt had two good chances at either end of the first half, the first a wayward curling shot before he miscontrolled Lee Cattermole’s through-ball when he had the chance to beat Wayne Hennessey. Despite Zaha and Bolasie having some joy when they linked up down the right flank, Palace were unable to find an isolated Connor Wickham up front, as the teams trudged in at the break with the game goalless. 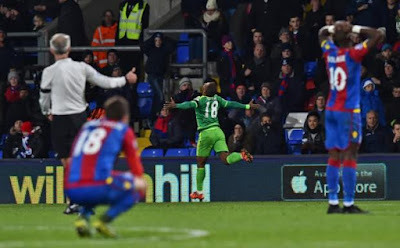 The second half showed more excitement in the first five minutes than the previous half when Coates rose highest at the corner, only to see his downward header clearer off the line by Cabaye’s outstretched foot. Cabaye in turn then had a chance of his own, when his dipping shot from the edge of the area was well pushed away by Costel Pantilimon. Next to go close was Bakary Sako who broke from the right and unleashed a dipping, curling effort just wide of the far post as the game was finally injected with some life. Sunderland had a golden chance to take the lead with 15 minutes remaining but Billy Jones completely miskicked from Duncan Watmore’s cutback before Jeremain Lens’ shot was well saved by Hennessey. But, with ten minutes remaining, Defoe took advantage of a defensive mix up between Hennessey and Scott Dann to sneak between the Palace players as they left the ball to each other to tap the ball into an empty net. And despite Palace producing a more potent attacking threat as they pushed for the equaliser, they were unable to penetrate a solid Sunderland defence as they picked up a crucial victory to take back to the North East.